Removing Sims3Pack files from your computer is a simple task but it can become quite time consuming. If you want to remove a lot of downloads it can happen that the launcher acts up and you have to start over checking items and to find one specific download can become quite difficult. Because of this, it pays to pay attention on WHAT you are installing in the first place. 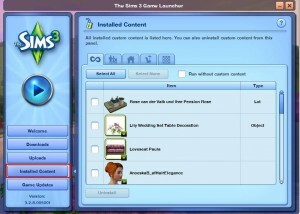 Especially houses and sims can contain a lot of other downloads. The launcher has multiple tabs on the side. The two important ones here are Downloads and Installed Content. If you download something from the exchange or the Store it only shows in Downloads. To check if something is already installed or not, notice the Plumbob/Arrow symbol under Status. Installed downloads also show grayed out. Downloads that are not installed, don’t appear in your game and don’t have to be uninstalled. If you downloaded a lot/household or a Sim there are bound to be other downloads to come with that. Those don’t show in downloads though. 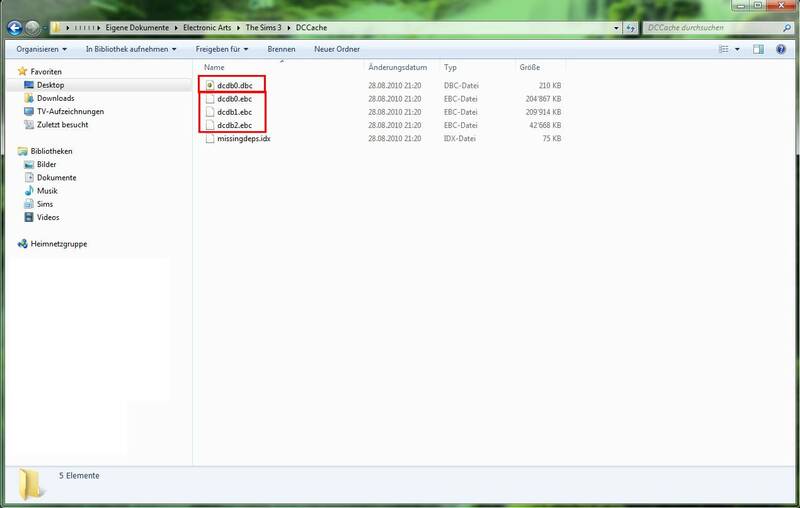 In Installed Content you can see all files that came with the house. The house also contains a Sim but that one is missing from the Launcher because he belongs to the house. All cc that was used on the Sim (here the hair) is now installed as well. Installed content shows in the order you have installed them. The newest ones are at the bottom (sometimes on top). If you close and reopen the Launcher, this order is messed up and completely random and you can’t sort. To uninstall a certain download, you can now check the box nest to it and click on uninstall. The download should now be gone from your game. To also get rid of the download itself go back to the downloads tab and click delete. If you only delete the download, it will still show in your game. 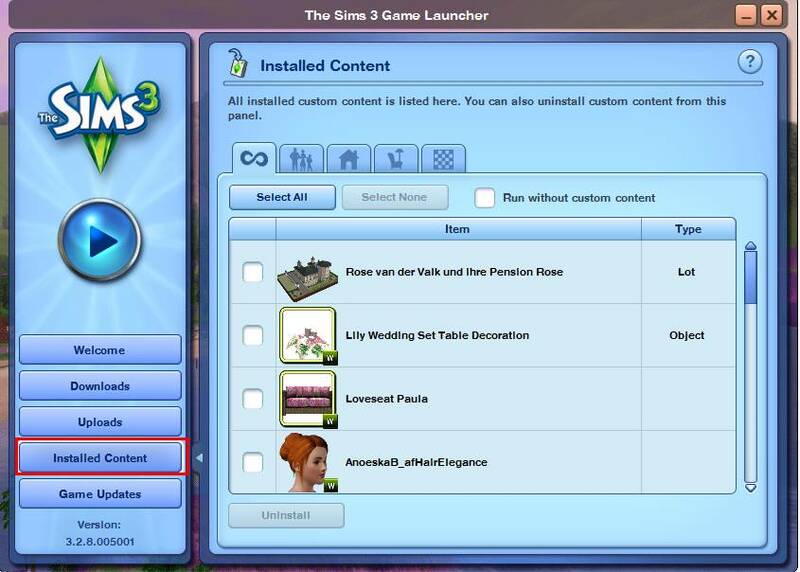 If you want to uninstall the custom content without using the launcher you can only uninstall them all in one go. The DCCache folder contains two types of files and a file called missingdeps.idx. I’m not too sure what that file is for but it is recreated if you delete it. The first type of files has the extension dbc, the second one ebc. The ebc-files contain the Store content you have in stalled, the dbc ones are third party content except houses and Sims. Worlds are installed in the folder InstalledWorld but most of the time they contain extra downlaods that are installed in the ebc- or dbc-files. Move the dbc and ebc files to a safe location (if you only want to get rid of third-party content, only move the dbc files) or delete them if you’re sure that you won’t be using them anymore. Now all files except those that come with a Sim directly. Unfortunately the launcher is not very reliable and there are several issues. The download is still in my game although I correctly uninstalled it. 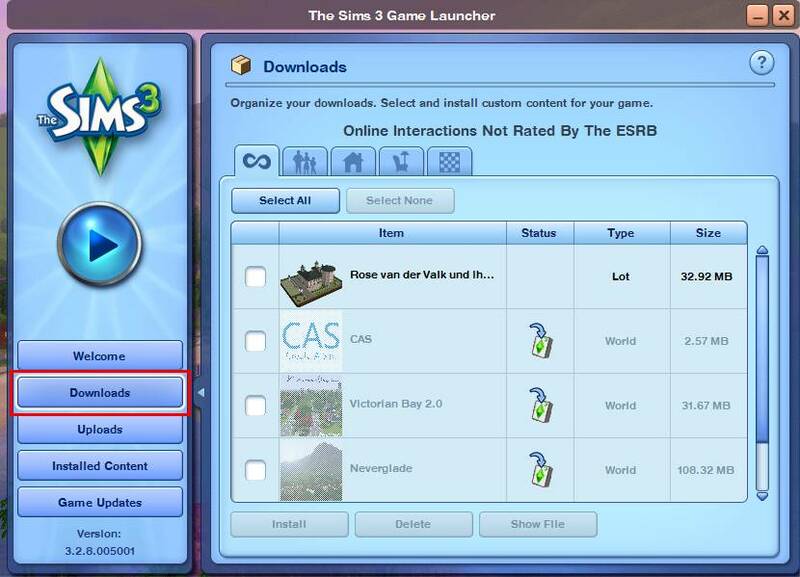 Also delete your cache files and check on the icon ingame to see if it’s really a Sims3Pack you’re looking for. Could be possible that the same download is installed through different means. You’ll get this message if the download came with a world. You can’t uninstall those unless you also uninstall the world itself. Most of the items need to be uninstalled separately after removing the world. It could be that other items have dependencies but I don’t know what that could be. Those two folders contain backups of your files. Deleting them will do nothing in terms of showing up in the game. 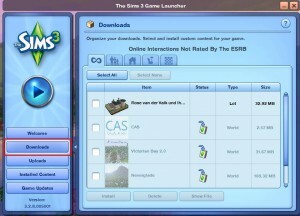 Downloads contains the Sims3Packs, DCBackup the Package-Files that were inside the Sims3Packs. If you delete a download in the tab Downloads, it will be removed from the downloads folder. The files in DCBackup are never deleted. This can lead to problems and can take up a lot of disk space. I would suggest, to move the files in downloads to external drive so that you have them handy if you need to reinstall. Think up some sort of sorting system that fits you. I would clean out the DCBackup folder entirely except for the file ccmerged.package which is needed for the premium content to work properly. Only disadvantage you have is that they won’t get pack with any lots/households/Sims that you upload. Another method to clean out the DCBackup folder would be to make a list of all numbers that belong to the download (they show in Custard). If you remove a download you can then manually delete the corresponding file from the DCBackup. This will be very time consuming though.